I'm wearing the costume in this photo. The idea for my costume obviously came from the movie Black Swan. 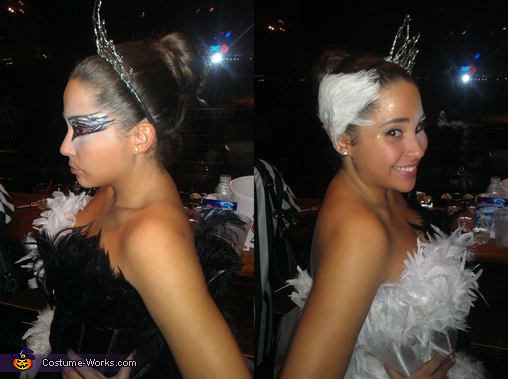 I knew the black swan would be a popular costume this year, so I decided why not do Black Swan vs White Swan. Kind of resembling a persons "bad" side vs their "good" side. I made the corset part of the costume using black and white satin and black and white feathers. I attached feathers along the entire top portion of the corset (made by me also) and I attached more feathers along the bottom of the corset to lay on top of the black & white tulle skirt that I also made. For the head piece, I used jewelry wire to assemble a half of a crown (as worn by the black swan) and on the other side I used a white feather piece. I attached the crown and white feather piece to a piece of black elastic, and wore it as a headband. do you have a picture of the whole costume?